By the power of Grayskull, get ready for this: The Masters of the Universe reboot is back on the docket, with news that Jon M. Chu (Step Up 2 The Streets, Justin Bieber: Never Say Never, G.I. 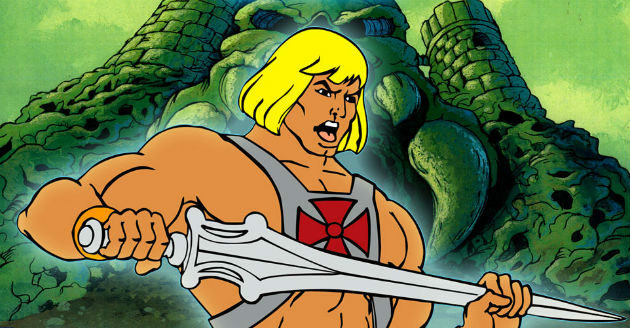 Joe: Retaliation) is in talks to helm the He-Man flick. Per Deadline, "the film revolves around He-Man, a prince who transforms into a warrior and becomes the last hope for a magical world that has been ravaged by the sinister Skeletor." Well, duh. Chu, who revitalized and set the pace for the Step Up franchise post-Channing Tatum then handily served up Bieber Fever with a well-conceived flick of that mop-top in 3-D, is currently converting G.I. Joe to 3-D for Paramount and directing Bieber's live concert tour. On top of that, the success of his superhero webseries The LXD gave way to an entire YouTube channel (DS2DIO) dedicated to dance. He's a busy guy with his hands in a number of youth-oriented projects and in his last three features has demonstrated a visionary knack utilizing dimensionalized space, although post-converting Joe wasn't his first choice. Will his Masters of the Universe also go 3-D? I wouldn't be surprised, but Sony Pictures and Escape Artists had better give Chu the time and money he needs up front if they're even thinking of putting MoTU out in a souped-up format. The next question is: Who could play He-Man? Chris Hemsworth, of course. He plays everything. Dolph Lundgren. Absolutely zero question about it. (1) What holds Skeletor's jaw in place? Duncan? Okay, but I like Kris' "MAN" better. I wouldn't be surprised, but Sony Pictures and Escape Artists had better give Chu the time and money he needs up front if they're even thinking of putting MoTU out in a souped-up format. ~ --------blackwhiteplanet _℃om ~~~~~ is for thousands of upscale men and beautiful women, who understand that ambition, success, and glamour are key elements of attraction. It's worth a try! Dolph Lundgren should play Man-in-Arms. According to the clips above, Bucky Larson should play He-Man. Chris Cook, the bodybuilder from Venice, CA. would be a better He-Man than any of the actors that everybody has on their lists. He would be a fresh face to the movie scene, plus he's tan and blonde like He-Man is. Save Chris Hemsworth to play the weaker and fair-skinned Prince Adam. Can't use Dwayne Johnson because of his Scorpion King role. All your other choices may be good actors, but they're just not buff enough to play my childhood hero! I'm sorry, but Chris Cook is where it's at!! By the way, HELL YEAH, SHE-RA SHOULD FOLLOW! Skeletor, I appreciate the support and I really hope the casters of the movie really really do consider big Chris for the role. You remember how every action figure of the collection was just freakishly muscular, right? I'm telling you, if it was up to me, there would be nothing but "musclebound fools" in that film. Like 300, but with bigger, bubblier muscles on their bones. Ha ha! Let me go make a list of who would play Teela, Evil-Lyn, and the Sorceress. I'll be back in a week. The action figures were all muscular. At least pick out some actors with muscular physiques. I mean, Jeff Bridges? Gerard Depardieu? Ralph Fiennes? No. Hell No. I know what the toys look like but the movie you want is a WWE movie that will about $8,000,000 at the box office. Every role doesn't need to be filled with jacked up wrestlers. What's your cast?